The Northern Star recently ran an article on our recent ‘Business of the Year’ award. CLAYTON Kearney said it was “by accident” that he started selling campervans. But the accidental start didn’t matter when he stepped up last Saturday night to receive the Busi- ness of the Year Award at The Northern Star Coast and Hinterland Business Excellence Awards, organ- ised by the Ballina Cham- ber of Commerce. 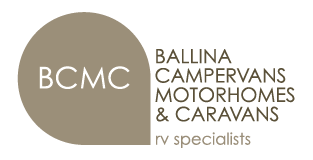 Mr Kearney is the owner of the Ballina Campervan and Motorhome Centre, and also the manufacturing business Horizon Motorhomes. “What a great honour,” he said at the gala awards night. Mr Kearney, a mechanic by trade, started the business as a car yard, with his parents, back in 1988. He said they accepted a campervan as a trade-in, and it sold pretty quickly – and this was in the days before the grey nomads were hitting the roads in retirement.